Along with other OEMs, Lenovo is also updating its Xeon Scalable server offerings to Intel’s new processor family, Cascade Lake, and is also offering some Optane variants as well. Lenovo’s announcement is unique in two ways: by offering a large eight-socket implementation with up to 448 threads and 24 TB of Optane DC Persistent Memory, and also offering its systems through Lenovo TruScale, its recently announced consumption based compute-as-a-service way of interacting with Lenovo’s product offerings. A total of twenty new and updated systems are set to come out of Lenovo today from its ThinkSystem and ThinkAgile product ranges, each featuring Intel’s latest Xeon Scalable Cascade Lake processor technology with up to 28 cores. All the options will also be available with Intel’s newest memory technology, Optane DC Persistent Memory, which offers up to 3TB of extra memory per socket. The headline product of the range is the Lenovo ThinkSystem SR950, which Lenovo states is the industry’s first eight-socket server featuring Intel’s new Optane memory. 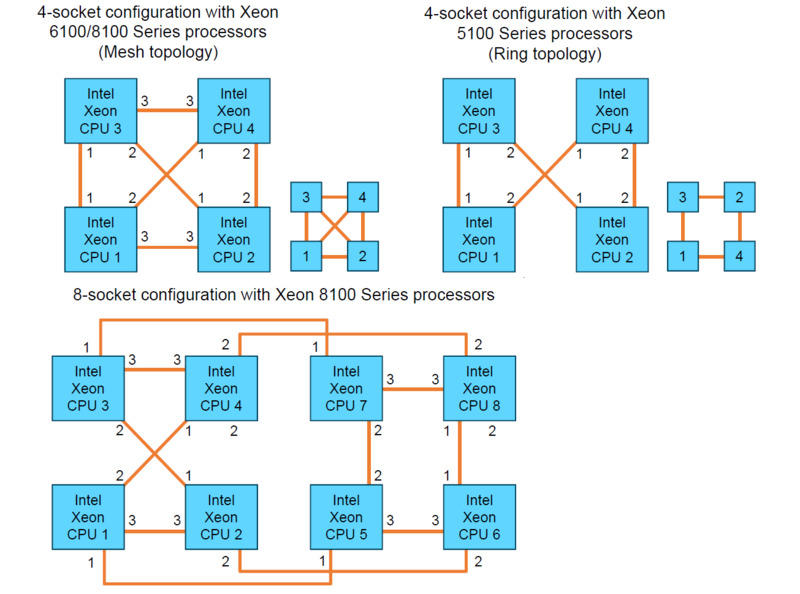 Intel supports up to 8 sockets using UPI (i.e. a glueless technology) – and we’ve seen it in the past with previous Intel microarchitectures – but it will be interesting to see how well it interacts with Optane. 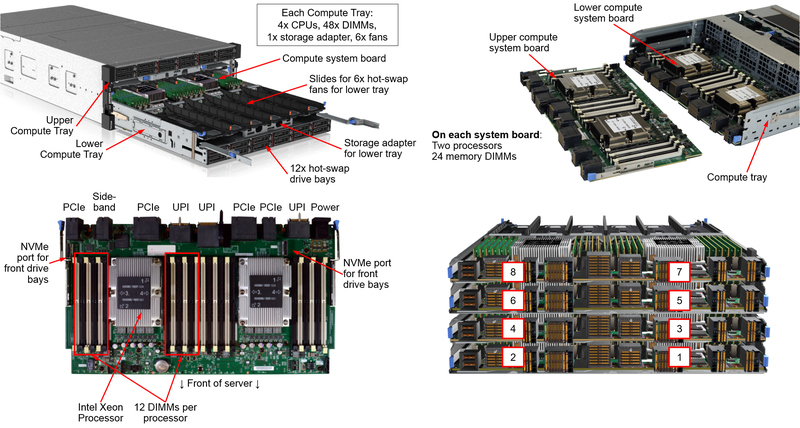 An 8-socket system represents the extreme end of a single system non-uniform memory architecture, and companies that build them typically have specific customers in mind. One of the numbers that Lenovo quotes is SAP HANA start-up recovery time: using a Lenovo ThinkStation system, the company quotes a reduction in start-up times from fifty minutes to four minutes by taking advantage of the ‘persistent’ nature of the Optane DC Persistent Memory. Intel also repeats similar numbers in its Optane announcement. Some of Lenovo’s offerings will be directed towards three key workloads: SAP HANA, Microsoft SQL Server, and Red Hat OpenShift Containers. Each of these product builds will be validated and labeled as Intel Select Solutions, noting to the customers that Intel has verified the systems as being focused for these use cases. Lenovo is keen to promote that it has more Intel Select Solutions on general availability than any other OEM, and will continue this trend with the latest Cascade Lake versions of its products. The company is also noting that its offerings will include Lenovo ThinkShield for data center products in order to extend security through the lifetime of the server. The other interesting vector in the announcement is Lenovo’s TruScale platform. The company recently announced TruScale as the server-as-a-service technology for its customers to use the hardware without purchasing it outright, leaving the deployment and maintenance to Lenovo. Just like other cloud offerings, it is a pay-what-you-use, and useful for companies that want to test before purchasing outright or deciding what scale of compute they require. 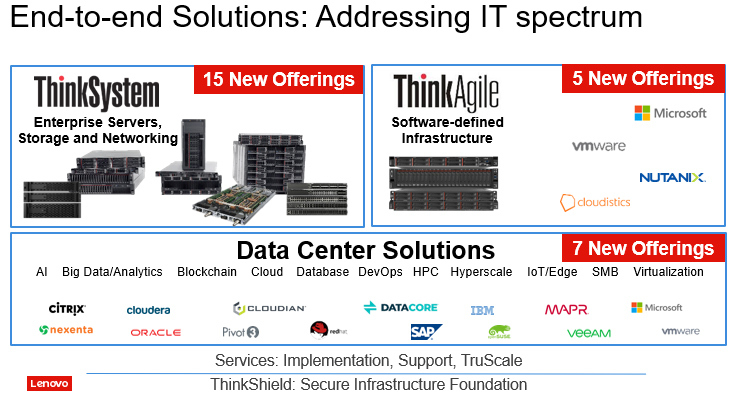 According to the announcement, all of Lenovo’s systems will be available through the TruScale platform. We’ve reached out to Lenovo for more information on its offerings, and to see if we can get details about that eight-socket behemoth. Stay tuned.